The Canadians in Suzhou, China could not have asked for a better day at the Curling World Cup. 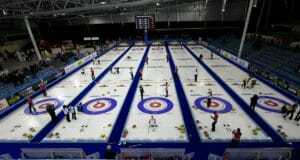 Canada’s men’s, women’s and mixed doubles teams dominated the competition on Thursday, outscoring opponents 48-6 over the course of five games. The victories put all three teams in good standing as they either complete or wrap up the first half of the double round robin draw. The mixed doubles team of Laura Walker (Edmonton) and Kirk Muyres (Saskatoon) kicked things off in the morning draw with a convincing 9-1 victory against Russia’s Maria Komarova and Daniil Goriachev. While the score suggests a high-powered offensive game from Canada, it was more of a slow burn that steadily applied pressure on the Russians. When it was all said and done, Canada only scored multiple points in two ends; a deuce in the first and three in the seventh. Walker/Muyres did not have the hammer until the fifth end. The team started the game with steals of two in the first followed by single steals in the second and third ends. After giving up one in the fourth, Canada scored one in the fifth followed by steals of one in the sixth and three in the seventh. 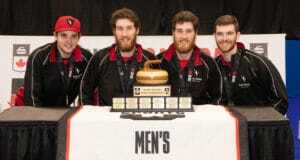 Russia conceded after this, awarding Walker and Muyres with their second victory at the Curling World Cup. The duo followed it up later in the day with an 8-2 win against the young Swedish team of Therese Vestman and Robin Ahlberg. Canada took control of the game in the fourth end. Leading 3-2, Walker and Muyres scored two in the fourth, a steal of two in the fifth and another steal of one in the sixth en route to the victory over a six-end span. “We knew going into it that the ice conditions were a little bit tougher than we’ve seen before,” Walker said. Walker and Muyres sit comfortably atop their pool with a 3-0 record while the other three teams share 1-2 records. Canada will play games against Kristin Moen Skaslien/Sander Olav Rølvåg of Norway and Komarova/Goriachev of Russia. Winning both games would secure Canada’s spot in Sunday’s final by finishing first in the pool. 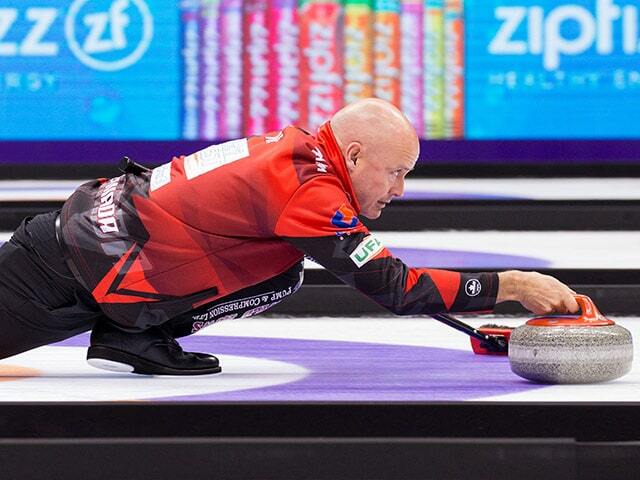 Calgary’s Kevin Koe had an impressive day at the Suzhou Sports Centre. His new lineup of third B.J. Neufeld, second Colton Flasch and lead Ben Hebert is gelling together nicely with two commanding wins in round-robin play. The first came at the expense of the 2018 world bronze-medallist Bruce Mouat of Scotland. The key shot was in the first end after Mouat missed his freeze attempt. This mistake left a golden opportunity open for the Canadians. Koe threw a double for four and took control of the game from the get-go. After stealing singles in the second and third ends for a 6-0 lead, Scotland mustered a point onto the board. But the Canadians responded with three in the fifth end, followed by another steal of two to end the game 11-1. The Canadian men’s team wrapped up the day with an 8-2 victory against Japan’s Masaki Iwai during the evening draw. Once again, Canada started the game with a big score that set the tone of the game. Japan’s Iwai had the hammer but was unable to land his draw in the house, resulting in a score of three. Canada followed up with another steal of two for an early 5-0 lead. Japan allowed Canada to tack on an additional three points in the next two ends, two in the fourth and steal of one in the fifth, before scoring a single in the sixth. Despite scoring, Japan conceded the game to Canada. Team Koe sits alone atop the leaderboard in its pool with a 3-0 record. It plays one game tomorrow against Peter de Cruz of Switzerland (1-2). Rachel Homan and her Ottawa-based team of third Emma Miskew, second Joanne Courtney and lead Lisa Weagle did not give up a single point on Thursday. The team took on South Korea’s Minji Kim in a 12-0 victory that lasted six ends. 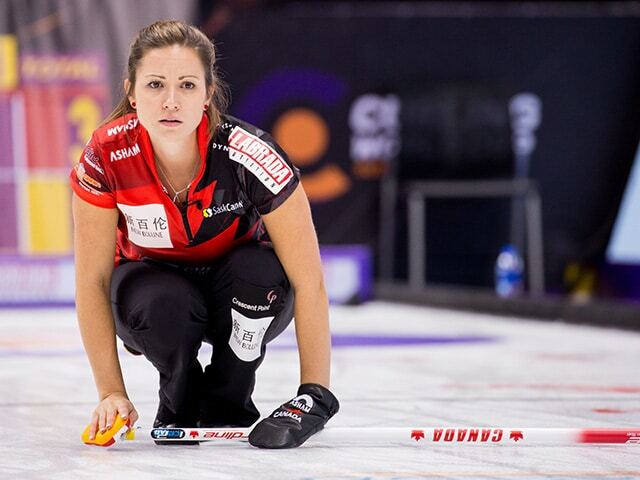 Homan started with the hammer in the first end and drew for two on her final shot. After that, Canada put up steals of one in the second, deuces in the third and fourth, one in the fifth, and four in the sixth. “The team played really well. 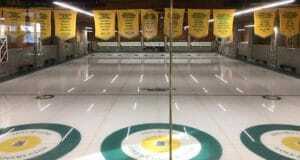 We got a good feel for the rocks and the ice,” said Homan. The Canadian women’s team will complete the first half of its double round robin on Friday with one game against Nina Roth of the USA (2-0) in the afternoon. Later that evening Homan will take on Russia’s Anna Sidorova (0-2). TSN and the World Curling Federation are providing live coverage of the Curling World Cup. For TSN’s broadcast schedule, CLICK HERE. The WCF will live-stream selected games on its Youtube channel.